The choice of enterprise wide systems has never been so great, so full of promise…and complicated! After years of predictable improvements the sector is undergoing significant disruption from new commercial models, more agile technology architectures and commercial innovation. Industry leaders SAP and Oracle are suffering increased competition from Microsoft Dynamics and recent entrants such as Salesforce.com and NetSuite. We are often asked to provide independent guidance on strategies for ERP, both by organisations who have already implemented a solution and are concerned to maximise their investment, and those that have yet to determine their best solution. ERP analytics – Businesses are asking for usable and meaningful analytic data on enterprise wide business functions, often with autonomous market / division complexities. The Hybrid Model is becoming increasingly attractive to organisations who are decentralised, or have a mix of established / major markets, and new emerging, or growth markets. 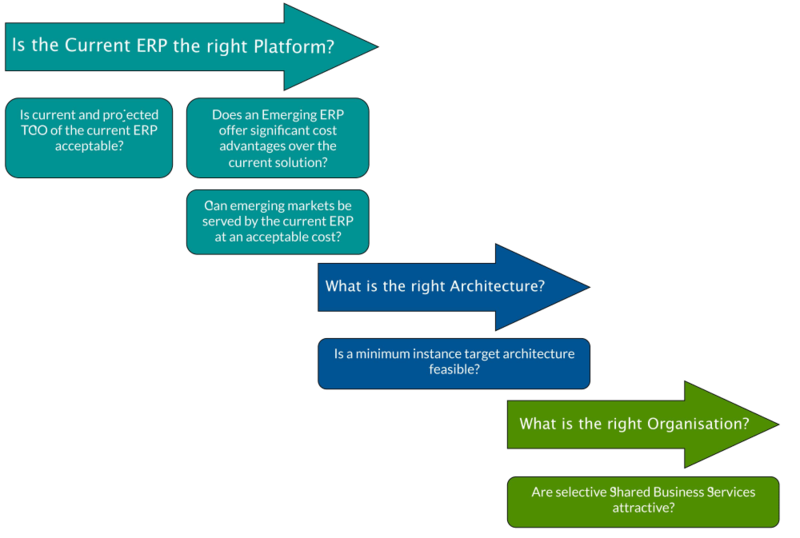 Often those new markets struggle to justify the investment required to adopt a Global Template / Standard, with the result that the global exploitation of a chosen ERP stalls.